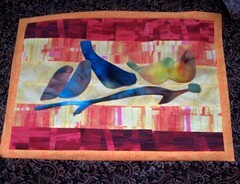 Posted on February 21, 2008	by Linda S.
P&B Textiles has 8 new quilt patterns up for their 2008 fabrics… oooww…lovely! Their free quilt pattern page has patterns that are available back to 2004. There’s also a pattern for a reversible wrap-around skirt. Look for an “easy Trip Around Baltimore quilt“…While you are there have a look at the quilts on the gallery page… wonderful! This entry was posted in ATC, Crafts, Free Patterns, Handcraft, Handwork, Quilt, Sewing. Bookmark the permalink.